More than 50 million tweets are being sent a day, according to the latest statistics from Twitter, and even the Dalai Lama is joining in with the fun. With traffic still growing on the micro-blogging platform, Twitter's data shows a major rise even since January, where some statistics put the daily average at 39 million tweets being sent each day. "As a member of the Twitter analytics team, part of my job is to measure and understand growth. 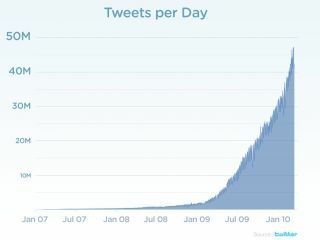 The graph above tells a story of how we've grown over the past three years in terms of number of tweets created per day. Please note that tweets from accounts identified as spam have been removed so the counts in this chart do not include spam," blogged Twitter's Kevin Weil. "Folks were tweeting 5,000 times a day in 2007. By 2008, that number was 300,000, and by 2009 it had grown to 2.5 million per day. Tweets grew 1,400% last year to 35 million per day. Today, we are seeing 50 million tweets per day - that's an average of 600 tweets per second. (Yes, we have TPS reports. )," he added. "Tweet deliveries are a much higher number because once created, tweets must be delivered to multiple followers. Then there's search and so many other ways to measure and understand growth across this information network. "Tweets per day is just one number to think about. We'll make time to share more information so please stay tuned." One person who is now contributing to those 50 million daily tweets is the Dalai Lama who has now got a verified account on Twitter. There have been a few fake Dalai Lamas in the past, but this one is the real deal (well, it's officially from his staff at least).